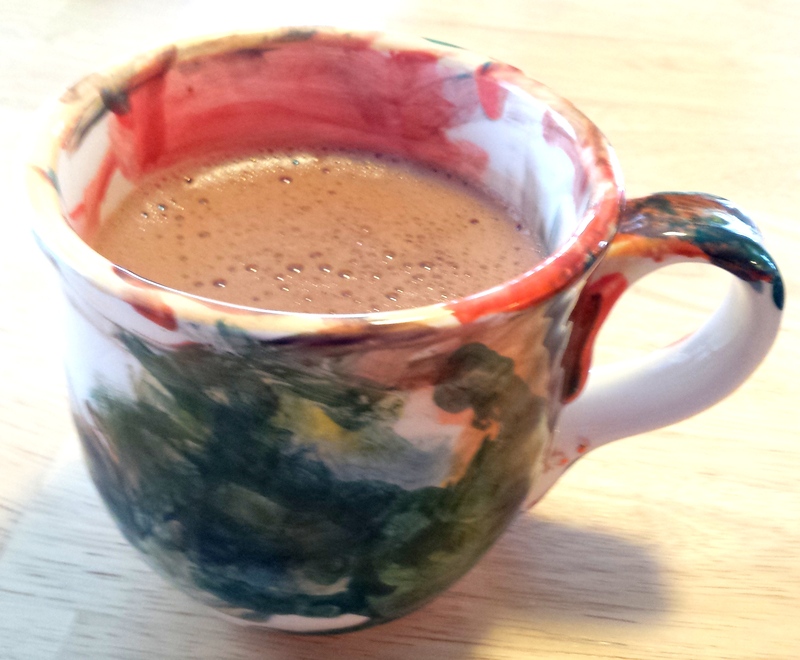 This is the companion to the Hot Chocolate recipe I posted yesterday. I love hot chocolate at night but in the morning this mom of four needs something a tad bit stronger. In the a.m. I love coffee. It is such a relaxing ritual for me and I can’t function joyfully until I have a cup in hand. I give it up during the first trimesters of my pregnancies because it increases my nausea but as soon as the 13th week hits I’m back. Every time I wonder if I should just give it up for good but the aroma is too enticing. Many nights I’ll have a cup of decaf before bed to relax again after a busy day. I’ve gotten to the point that I like my coffee with just a splash of half and half but a sweet treat from Starbucks still holds it’s appeal. Now I can indulge in a mocha without the guilt, or the sugar hangover, I’d get if I did swing through the Starbucks drive through (that I go past every school day). My mocha this morning really hit the spot. It was chocolately, creamy, had the hint of coffee flavor, and the caffeine needed (no judgement) to start the day. This is dairy free, sugar free, grain and gluten free and a THM S.
And, on a side note, isn’t this the cutest mug ever? My hubby takes the kids to a paint your own pottery place to make me special creations every couple of years. My oldest painted this on the first trip back in 2008 when he was 2 1/2 (sniff sniff). This post may have affiliate links. 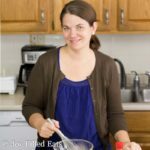 Thank you for supporting my baking obsession, this blog, and my growing family! If you use any of my links to iherb you save $5 and get free shipping over $20. They have competitive pricing for a lot of staples in THM. The promo code is FQM372 if you need it. 1. In a small saucepan heat the sweetener over medium low heat until until is melted. 2. 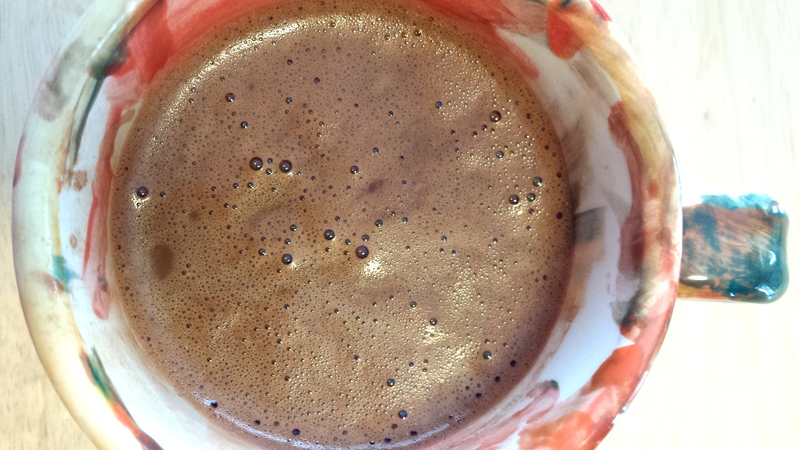 Whisk in the cocoa powder, almond milk, and coffee. When smooth add the salt and coconut oil and whisk until it comes to a simmer. 3. 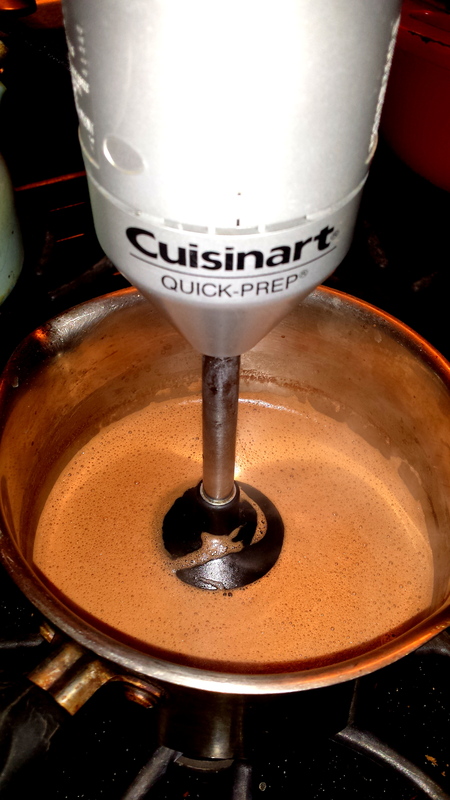 Use an immersion blender to blend until frothy. (You can transfer to a regular blender but be careful with blending the hot liquid). Let cool for a few minutes. It is very hot and I burned my tongue on my hot chocolate yesterday. Enjoy your guilt free mocha! Or here on wordpress by clicking follow in the lower right corner. My mocha this morning really hit the spot. It was chocolately, creamy, and had the coffee flavor I love. It is dairy, sugar, grain & gluten free & a THM S.
In a small saucepan heat the sweetener over medium low heat until until is melted. Whisk in the cocoa powder, almond milk, and coffee. When smooth add the salt and coconut oil and whisk until it comes to a simmer. Use an immersion blender to blend until frothy. (You can transfer to a regular blender but be careful with blending the hot liquid). Let cool for a few minutes. It is very hot and I burned my tongue on my hot chocolate yesterday. 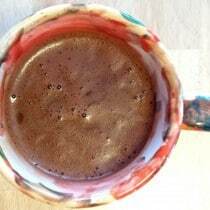 Enjoy your guilt free mocha! Just found this and made it exactly as written. It was BITTER! I even put in another teaspoon or so of Sweet Blend to try to give it some sweetness. It was thick, though! I'm sorry you found it bitter, Karen. My guess is it's the type of cocoa powder you are using. I really like nativa raw cacao (sold at costco) and its not bitter at all. Taryn, Just made this yummy Mocha tonight! I was needing a little sweet snack and I came across this treat! It's a bit of a cooler day here in Kansas! =) I really enjoyed it and hope to make it again, especially this winter! I am only on my first month of THM and it's going pretty well. Still figuring out the whole S, E, and FP, but I'm sure I will learn a lot more in the months to come! Thank you! I was just thinking how cute that mug was! Then to scroll down and find it was made by one of your kiddos made it so special! LOVE it. Thanks for this blog and recipes. Blessings to you and yours.